I followed links on Pinterest for a Jazzberry blankie and got to this tutorial for intermesh crochet. I think I would enjoy it... has anyone tried the technique? it gives a really interesting look, and i think you can create different patterns within the mesh depending on how you arrange the colors. as I recall, Margaret Hubert has a section on it in Complete Photo Guide, and i think I've seen it in other stitch dictionaries. haven't done it myself and right now at least it would be above my concentration level the closest I've come to the intermesh technique was a trivet in reversible shells stitch pattern https://books.google.com/books?id=sAwNBAAAQBAJ&pg=PA166&lpg=PA166&dq=hubert+crochet+reversible+shells+-pinterest&source=bl&ots=FM5kKy3TUY&sig=tspIvFihsReBagZaILT-cqR8XEc&hl=en&sa=X&ved=2ahUKEwj1o9Gzza7dAhXp34MKHUjfBVIQ6AEwC3oECAIQAQ#v=onepage&q=hubert crochet reversible shells -pinterest&f=false I know it looked good but I don't remember much about the process of making it. Looks beautiful and I have not tried that stitch pattern before. Something that I'd like to try sometime though. I found vids on U Tube but it is a bit more effort than my little pea brain can follow just now. 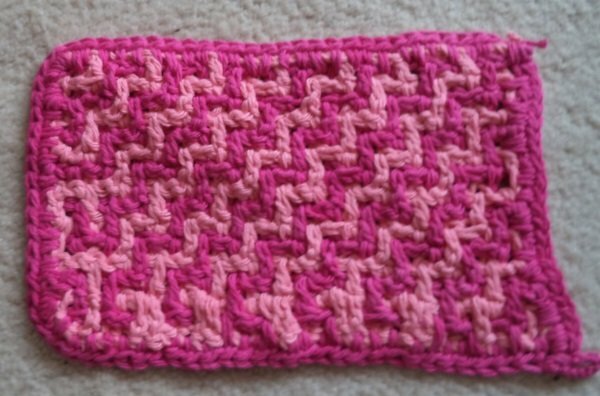 It is kinda cool, I made a trivet a couple of years ago using what looks like the same stitch pattern as your blanket. (edit - just found out the links don't work while still in post mode with the new software, it also didn't seem too obvious it was a link). Within this linked page there's another link to a generic interlock 'how to' tutorial. "Foundation row A as usual. Chain second color, weave chain in and out of white base row and complete as you would start in row 2 of your white. This starts row 1 row earlier. End with white row." Obviously sub your color for the first and last row instead of 'white'. Hope this helps, it made sense to me when my head was more into the pattern than it does now. Not sure if it helps, but here is a photo of my little project - you can see the beginning and end colored row looks a little different than the pattern photo, more like the rest of the rows do. Crikey, sorry it's so big. This looks like fun. Wish I had the time to make something with it. That looks great. I knew you would get it. Yay, glad it clicked for you, and it looks great. that hat looks difficult. would need some practice before attempting it. TFS though. Hi all. Donna has asked me to let everyone know that she is in the midst of evacuating because of the hurricane. She said she will work on tweaking some things from the software update when she can. Sending hugs and prayers to Donna and those in the path of Florence. so I did get it to work but I found the method rather annoying. I made it large enough to work as an exfoliating facial scrub. It's a pretty design, but I can see how it might be tedious. Nice! I see your point though....but it does look cool, doesn't it? Thanks for the links. Years ago, I bought a kit at a yard sale that made a small Afghan with concentric squares, and man, was it warm. On the old Compuserve craft forum, James Walters taught a class to show how to use more than two colors. I like the zigzags; they’d make a neat cowl.